Concordia University, St. Paul, senior Kayla Koenecke (Delano, Minnesota) has been named to the 2013 Capital One Academic All-America® Second Team as selected by the College Sports Information Directors of America (CoSIDA). Koenecke becomes Concordia volleyball’s 10th Capital One Academic All-American and this is the first time she has received the honor in her decorated four-year career as a student-athlete. She joins football senior Mike Willett (Woodbury, Minnesota) as two Golden Bear Academic All-Americans this fall. She’s the only volleyball student-athlete from the Northern Sun Intercollegiate Conference (NSIC) to be named to any of the Academic All-America teams. She carries a 3.59 grade point average while working towards a degree in marketing. 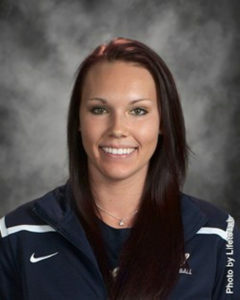 She is also a three-time NSIC All-Academic student-athlete. On the court, she was a four-time All-American (three-time first team) and four-time NCAA All-Tournament Team selection while leading the Golden Bears to four national championships. She led the nation in hitting at .410, was seventh in the league and led her team with 3.63 kills per set, was 17th in the league with 3.52 digs per set and finished 39th in the country with 4.22 points per game.